Past performance is not a guarantee of future results. Indices are not available for direct investment. Index performance does not reflect the expenses associated with the management of an actual portfolio. Market segment (index representation) as follows: US Stock Market (Russell 3000 Index), International Developed Stocks (MSCI World ex USA Index [net div. ]), Emerging Markets (MSCI Emerging Markets Index [net div. 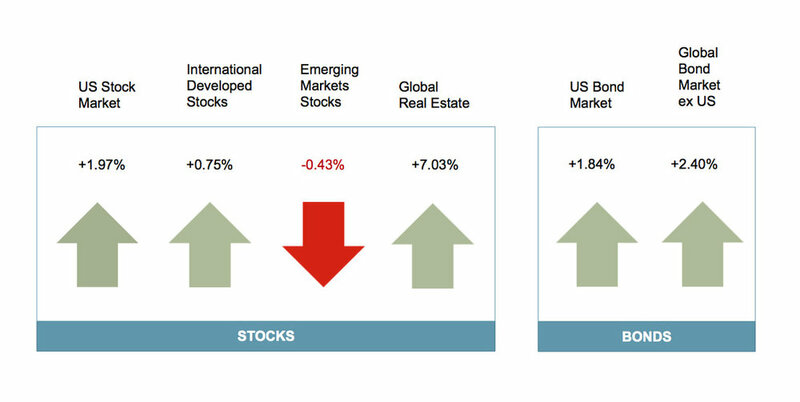 ]), Global Real Estate (S&P Global REIT Index), US Bond Market (Barclays US Aggregate Bond Index), and Global Bond ex US Market (Citigroup WGBI ex USA 1−30 Years [Hedged to USD]). The S&P data are provided by Standard & Poor's Index Services Group. Russell data © Russell Investment Group 1995–2013, all rights reserved. MSCI data © MSCI 2013, all rights reserved. Barclays data provided by Barclays Bank PLC. Citigroup bond indices © 2013 by Citigroup. US long-term bonds, bills, and inflation data © Stocks, Bonds, Bills, and Inflation Yearbook™, Ibbotson Associates, Chicago (annually updated work by Roger G. Ibbotson and Rex A. Sinquefield). Dimensional Fund Advisors (DFA), MarketWatch, Vanguard, Fidelity, Index Funds, Rogowski Wealth Management.